We specialise in fun and affordable Music, Dance, Story Time, Signing and Messy Play activity classes for babies, toddlers and preschool children from Birth to 4 years. All activities aim to develop language, self-confidence, imagination, coordination, concentration, gross and fine motor skills and communication skills to prepare your child for nursery and school. We teach classes within the Chorley, Preston, Wigan and Bolton area and private sessions in nurseries, schools and childrens' centres. Song is a special type of speech. 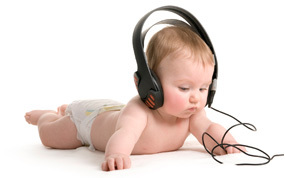 Your baby loves the sound of your voice, they are your number one fan, even if you think you can't carry a tune. Your voice and those around you are the first sounds they hear within the womb so they are naturally attuned to it. Singing encourages bonding, vocal experience and speech development as your baby may try to join in the singing and imitate you. Lullabies, songs and rhymes of every culture carry the melodies and inflections of your spoken language and conveys emotions which can be understood universally. Teaching children how language is constructed, preparing a child's ear, voice and brain and listening to, and singing along with rhymes and songs uses and develops both sides of the brain. Musical experiences are an important way to help create these pathways, also called neural connections. And while listening to music is key to creating them, when children actively participate in music that is when they make the strongest connections. Research shows that when children are encouraged to sing at an early age, their voices become an actual instrument they can use effectively. Furthermore young children who are actively involved in music, have higher educational achievement, have good communication skills and higher self-esteem and are better able to focus and concentrate. For infants and children who are not able to communicate through voice, music is a way to express a thought or feeling. Singing together can also boost your baby's confidence and can be a relaxing and fun activity for you both to share. Messy Play is essentially an exploring process it builds on children's curiosity and encourages a positive approach to new experiences. It contributes to babies and young children's' cognitive and creative development and offers valuable pre writing skills. 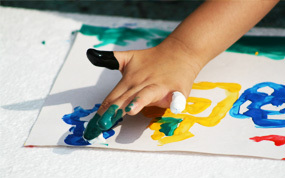 Messy play engages all senses, touch, vision, sound, smell and taste. 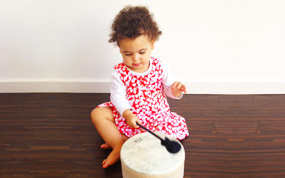 In Rhythmicality classes we have a 10-15 minute messy play activity where children can develop concentration, problem-solving, planning and seeing things through to completion. Our activity is set around our story/class theme, whether than be Butterflies for The Very Hungry Caterpillar or Squelching in Chocolate Mud as we go on a Bear Hunt, each activity is safe and fun.